Many lake owners like having electricity at their dock and a light on the shore at the water’s edge. 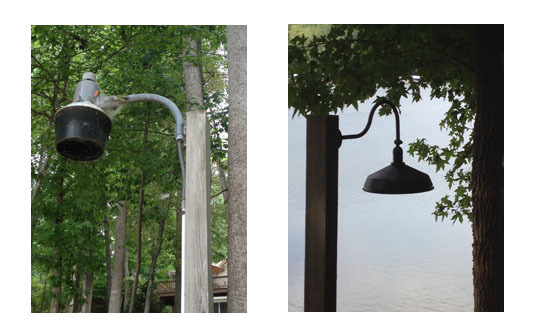 The Corps of Engineers has updated the regulations on these lights requiring them to be “down lights” that don’t send light out onto the lake. A simple fix for people with existing lights like this one is to paint the plastic shield so that the light only shines down. While this is acceptable by the Corps of Engineers, it ain’t beautiful - as you can see from the photo of my original light. I elected to swap mine out for something with a little more style, and at the same time, reduced the wattage from 100w to 30w using an LED bulb with the equivalent brightness of a 120W bulb. I found my fixture at Amazon. Most of the fixtures at the local stores were on the small side.